Cross Training on the schedule today. I opted for a rest day given I'll be running 20 miles tomorrow. 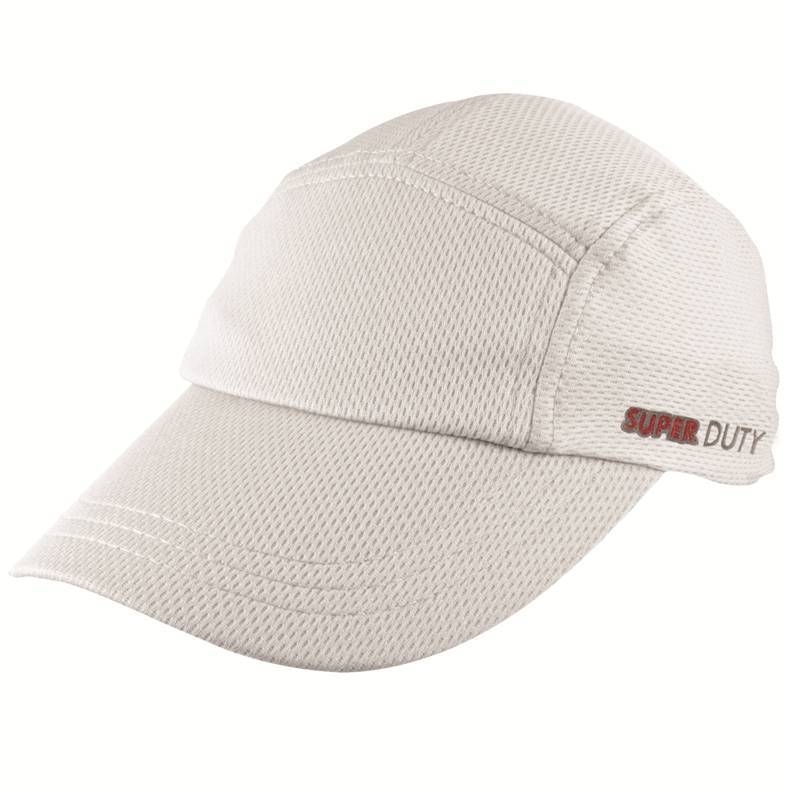 Christy H (no blog) who ran 2 - 10k races in Seattle, WA in 1:02:45 and Tacoma, WA in 1:03:28 - Christy wins the Headsweats SuperDuty race hat! Congratulations. 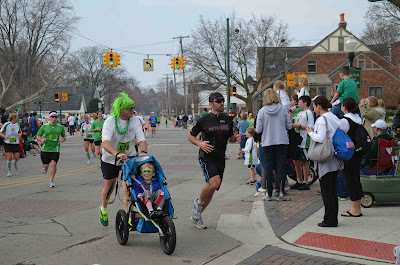 Josh from Clippin' Along who ran the Shamrock 10k in 50:28. 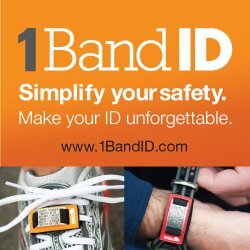 Josh wins the 1BandID! Congratulations. 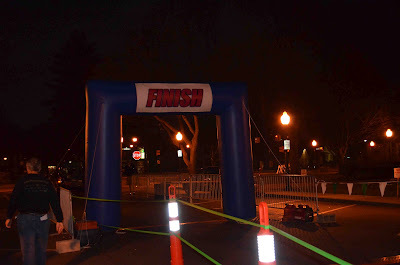 Kona's Race #2 - Solstice Run - online registration open now. 5 miles on the schedule today....done! Perfect outside....for March. The next Kona Running Company race this season is coming up and online race registration just opened. 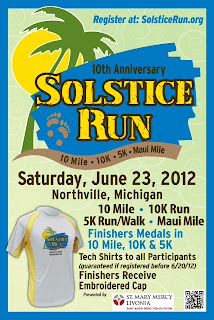 If you have not heard about it, it's called the Solstice Run and this is a GREAT race. It will be the 10th anniversary of the race! 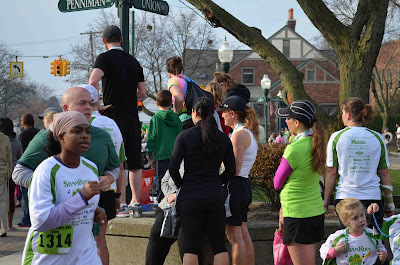 I have run the 10 mile the last two years and I plan on running the 10 mile this year as well. 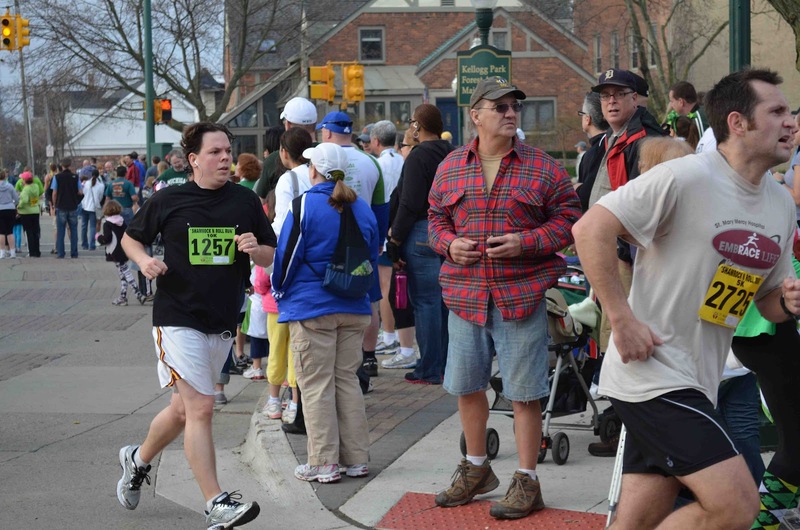 It's one of the few 10 miles races in Michigan. This is the only race I will have run three years in a row since I started running three years ago. To top it off.....it's on June 23rd - my birthday!!!! What's better birthday present can you get than running this race? Nothing! Ok, maybe winning the Mega Millions lotto might be a close second. Ha! Given this is the 10th anniversary of the race, they will be including 10th anniversary hats in the race packet this year for every runner and a tech shirt along with a medal for all 10 mile and 10k finishers. Very cool! 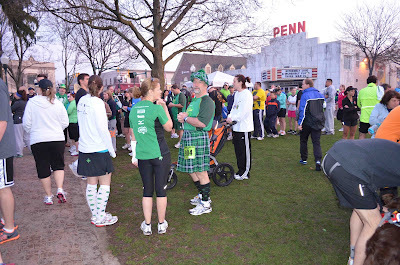 Of course, if you raced their last race, the ShamRock N Roll Run(See my review HERE), then you know they know how to put on a fun and organized run. As you can see above, the course takes you out into the neighborhoods of Northville and then you finish up in Ford Field - also a great place to finish. It's really a well planned course. 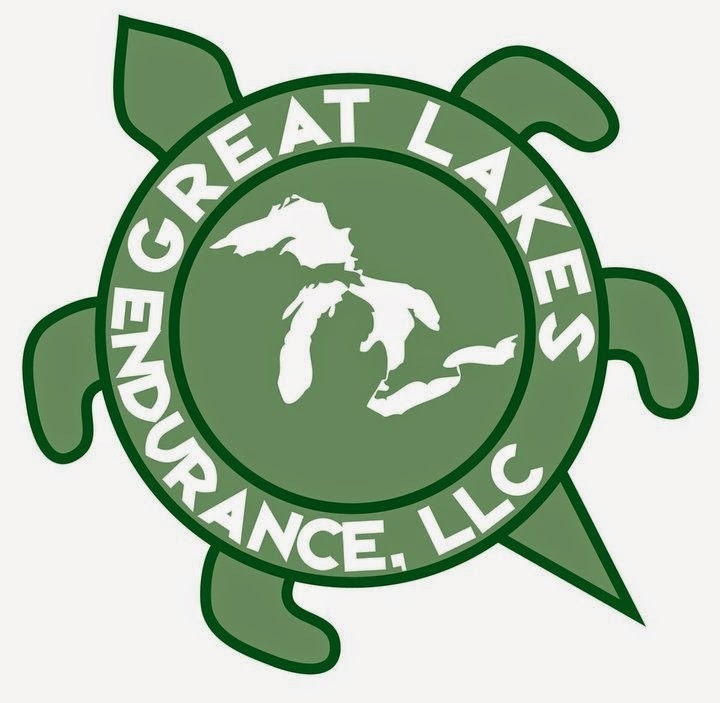 If you need to get your training in for the race, you can also use their free training programs for 10 mile course design by the infamous Doug Kurtis. Interested in running with me? Sign up by April 20th for discounted pricing! We've had some crazy weather in Michigan this year. Our winter, like much of the country, has been unbelievably good with very little snow. I think I shoveled twice! Also, March has been cold, then warm, then really warm, then cold then warm. Mother nature can't seem to decide what it should be. Yesterday morning I decided to get to work a little early because I wanted to take some pictures of the awesome looking bradford pear trees near my office. It sure looks spring in this picture, don't you think? It makes me imagine what it would be like to run in Washington DC right now with all the Cherry Blossom trees. That must be a great experience running through all those trees. 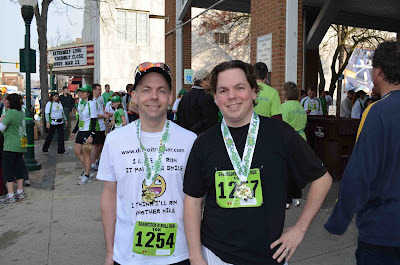 So my running buddy and I decided not to run our local half marathon this year, The Brooksie Way. It's close to both of us and is a great race but the biggest issue is that it falls right on the weekend we have a 20 miler plus it's also two weeks before the marathon. 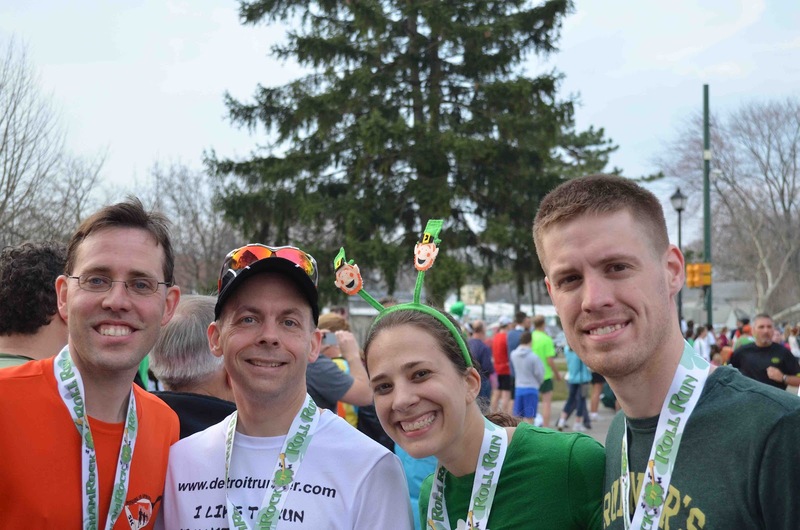 I think since we are already doing a half marathon two weeks before the Flying Pig(and can't race it), we figured we'll just run our 20 and be happy with that. Perhaps I'll find another race that fits in on a better weekend. Of course, we could always get up early, run 7 miles and then do the race as a training run but I'm not sure I really want to do that(and I don't think he wants to either) So the search for a half marathon begins to help fill out the rest of my season. I'm booked for the rest of the year otherwise. 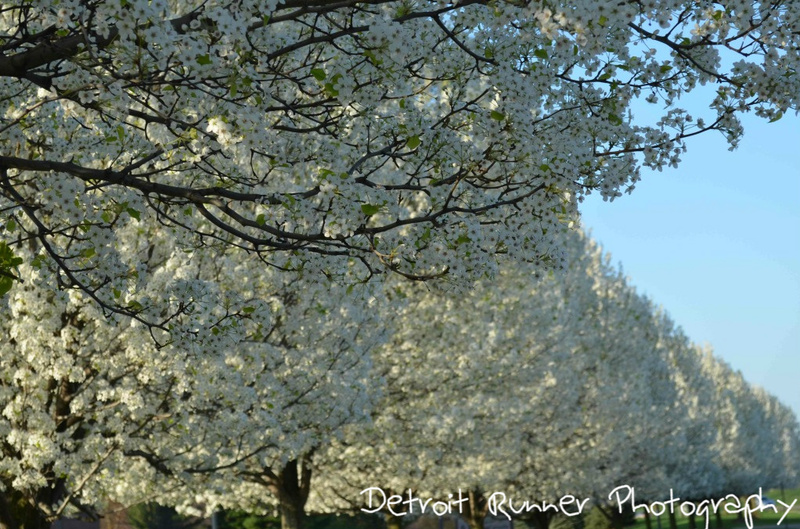 I also posted a new photo on Detroit Runner Photography if anyone is interested. 5 on the schedule today....done! Much nicer today than yesterday. Drymax was awesome enough to send me a couple pairs of their running socks. They sent me two pairs, one pair is their Running Lite-Mesh sock and the other pair is for Cold weather running. Drymax brand is the #1 sock to keep feet dry especially compared to Polyester, Acrylic and wool. Take a look. See? No issues with length; really comfortable too! According to Drymax(and I personally agree), for a runner, moisture is the feet's worst enemy. I have to tell you I should know. I hate running in the rain and sloshy snow but I do it time and again and it can really tear up your feet. Also, while not as bad(for me at least) is sweaty feet. You just feel so much more comfortable if your feet are dry. "Moisture won't stick to the inner layer of Drymax fibers because they are Super Hydrophobic(moisture hating)" That sounds great to me. It's like having a tech shirt on your feet. There are a number of things that make the Drymax socks comfortable including: A flat toe seam, a vented arch band, breathable mesh, a smooth top, a Y heel to improve fit and dual layers in parts of the sock. One thing that did surprise me was the type of sock they sent being a "No show" height. Of course, I did not specify a type as I was happy to review what was sent. Basically, you can just see the top of the sock outside of the shoe. Normally, I wear a 1/4 height sock because I like the sock up a little to ensure my skin does not hit my shoes. I thought to myself, "I have the socks, I need to try them" Oh my gosh, these things were great. Ok, not just the lower height, which was no problem at all, but the feel of these things are great. The first run I did with them, I could barely tell I had socks on and my feet stayed nice and dry and cool. Fortunately, we had about 10 days where it got nice and warm out so I was able put these to a full test. These also work great with "barefoot" type shoes. Due to the short length, you don't looks so dorky wearing socks. I'm not one to run without socks, even in shoes designed to be worn without socks, so these will be a perfect fit when I run with these shoes, especially as I start to hit the trails more. In regards to the cold weather socks, as you can see, they are much taller. On me, they go up to about my calf. Personally when I tried them on, I thought they might be too tall. There was no issues being that long. In fact, they actually helped keep your leg warm as I was running. I also think these would be great for any other winter sports to help keep your feet dry and warm. There is certainly a different feel to these than the wool socks I am used to running with in the winter. First off, they are much more comfortable than wool. My feet almost felt massaged after my run. Secondly, they keep your feet warmer - even warmer than wool. I suspect that is because there is no moisture building up around my foot in these but there is on the wool socks. 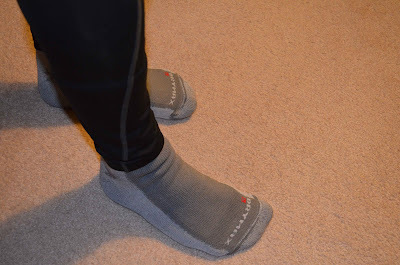 For me personally, if my hands or feet are cold, then it's hard for me to have a good run so these will be a staple in my running wardrobe during the cold times. 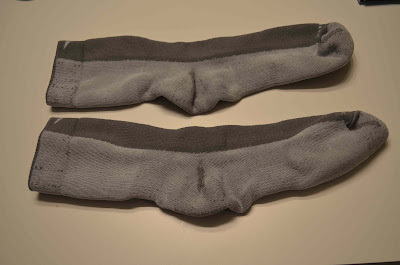 Without good socks, I probably would not run outside in winter at all. Unfortunately, we are back to coldness in Michigan. My run yesterday morning was in the mid 20's---- Brrrr!!!! My conclusion? 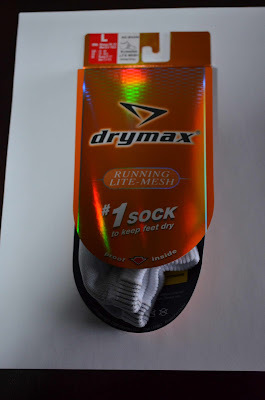 I will certainly be picking up some more Drymax socks in the future although my personal preference is to get the ones that are a little longer for summer running. Check them out. 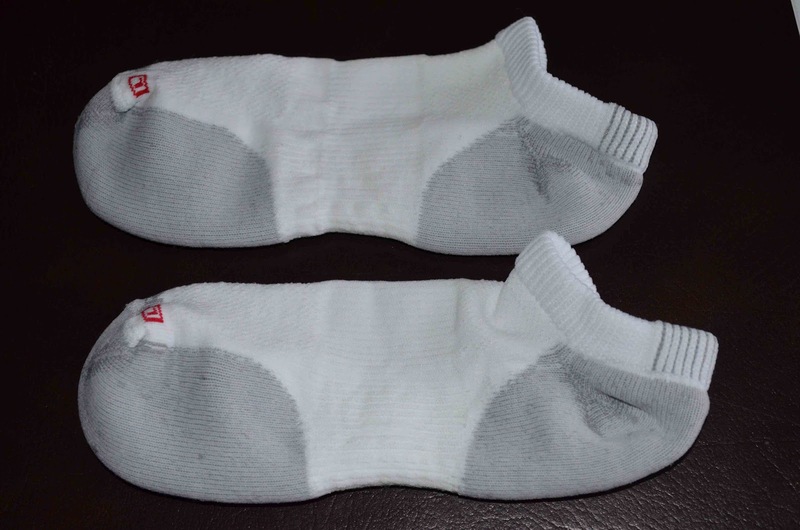 I believe you will be very happy with the quality and performance of the socks. * Note: I received two pair of Drymax socks in exchange for a review. I was not required to give a positive review and all opinions are my own. 5 miler on the schedule today....done! Another pair of shoes bites the dust. My favorite shoes are going minimal. Well, ok, not really but they are going to an 8mm heal to toe drop and I'm used to a 12mm. It's the new Ride 5 coming out this fall. I'm hoping it will not be drastic. On a positive note, it looks like I'll be testing a pair of trail shoes shortly which are at a 6mm drop so this will give me a chance to get used to a lower drop. Looks like all shoes are moving this way. Last night I was watching the national news and they were talking about a new surgery where they can fix people with Type 2 Diabetes. Not just any weight loss surgery. It basically changes their numbers so they are almost instantly not diabetic anymore(within hours or a couple days at most) without even losing the weight. The surgery is a stomach procedure so they can lose weight which happens after. What are your thoughts on this? First, I was to preface this with I'm not against the procedure. If it makes people healthy, then I'm all for it to help keep health care costs down. What I do worry about is people that do it because they do not want to work to lose the weight. Of course, the segment said that the surgery is for people who have tried diet and exercise and it has not worked for them. If that was truly the case 100% of the time, I'd feel better about it. My first thought is that people need to try to lose the weight. I'd even go as far to say that unless there is some hereditary reason for the weight gain, they should be able to prove(through a doctor) that they tried and could not lose the weight. 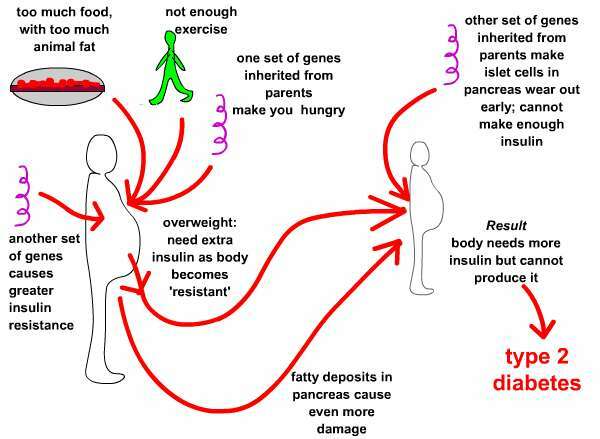 The biggest shock - 23 million people have Type 2 diabetes!!! Wow! What does this mean? We will all pay for these people at some point through higher cost insurance(unless the insurance companies charge them more which some are doing)....but that's for another blog post. I'd be interested to hear your opinion. Anyone see the segment on ABC news last night? 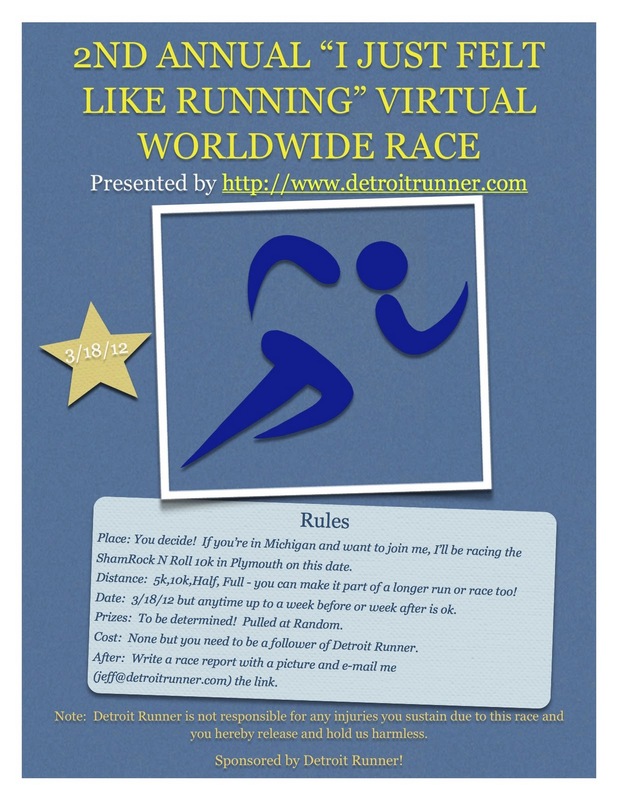 I decided to also give the people that signed up for my Virtual race a few more days(until Friday at Midnight) in order to submit their race results. Thanks for those that have already submitted theirs. We had lots of people sign up but I have not received many race results and I need that to pick a winner. After that, I'll pick the winners but I want to give people one more chance to read this. I hope everyone understands. Well, this past week was a cut back week and I can say that it was nice to have that. Unfortunately, I'm still dealing with an ear infection. The medication I started on did not work so I had to get a new prescription. Hopefully this will fix me up. I really need to get better for my half marathon in a month. Fortunately, it has not interfered with my training as I was able to get everything done last week. This week is a big week(only 6 weeks left!) with 43 miles on the schedule but the reason it's so big is that I have my first of two 20 milers coming up this weekend. Yikes! This will be my fifth 20 mile run in training that I've done so I've gotten used to them - not! 20 miles is a long way to run, in my opinion. Because my training plan has two of them, the plan is to do the first one at an easy pace with an overall flat run. I'll also be running it on crushed limestone on the Paint Creek Trail to help easy the pounding on my legs. Last time I ran 20 on Paint Creek - that's a long way! The plan will be to run the entire length of the Paint Creek Trail starting in Rochester and going to Lake Orion and back. That will give me 18 miles. For the remaining two, my plan(assuming I can convince my running buddy) is to run a couple miles up Tienken Road and back. 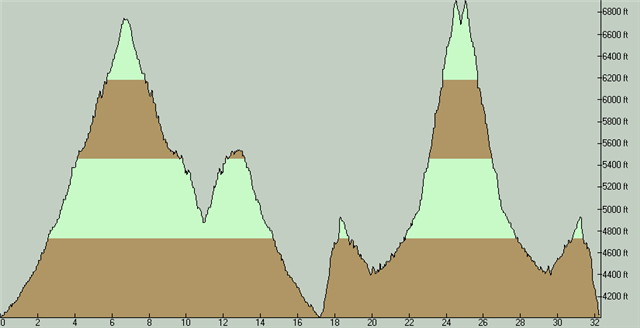 For those of you that don't know the area, Tienken is quite hilly. 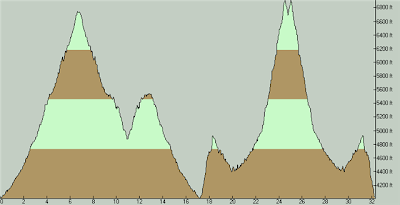 I'd like to run 17 on the trail which is flat and then do two miles on Tienken where it's very hilly then back to Rochester. The reason I want to do this is that we still need more hills training plus I want to see how my legs take going up hills after running 17 miles. It should help give me an indicator on how my training is going since the Flying Pig is a very hilly course. I also plan to get up an hour or two early to eat something just as I would for the race. Effectively trying to simulate what race day will bring. So that's the plan for the week. I ran all last week alone since my running buddy was on vacation so I'll be happy to get out there with him again(especially for 20 miles). 13 miles on the schedule today....done! I did 13.1(of course) at Stony Creek alone. 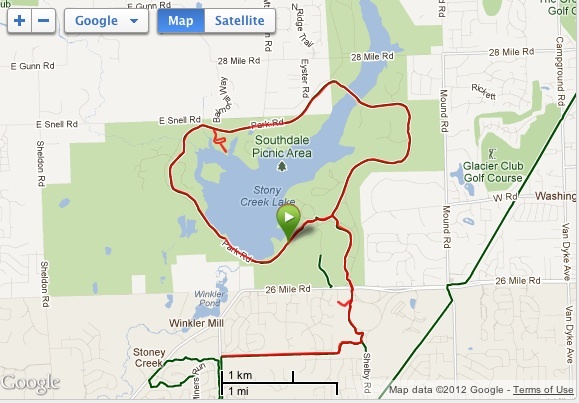 Had a really nice run there with an out and back to start things off and then a loop around the lake. 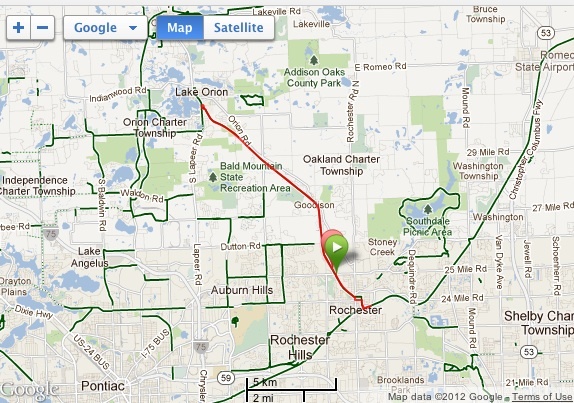 Here's the run - did my splits a little faster today with an average of 8:34 per mile. I had to throw in a couple side runs to get to 13.1 at the end. It was very nice weather for running but cooler than this past week. I'm not complaining and will take this for sure in March! So today Stony was relatively scarce of people. I am assuming that many of the runners were doing a race. 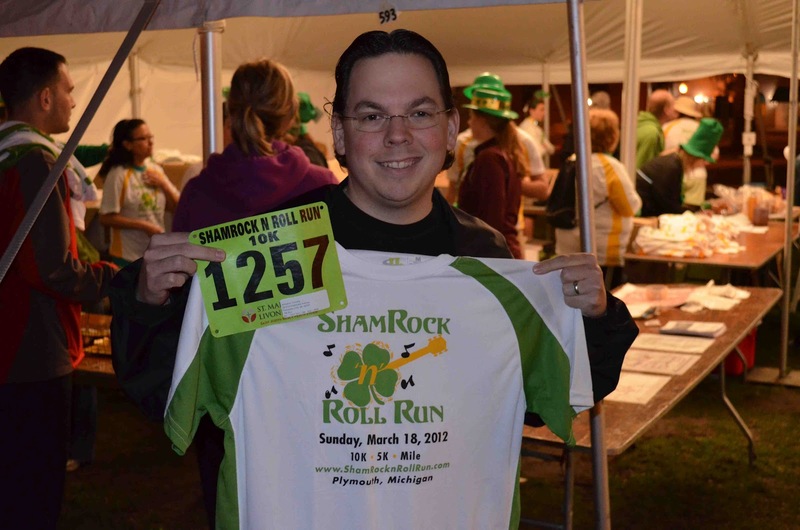 Last year I did the Rock CF half marathon down in Grosse Ile. It was today as well. Actually much better weather today than last year so I'm sure people had a great time. Of course, I felt a little left out not being there - it really is a great run on the Island. I could have gone there this morning and just signed up but I really ended up not going because it's not around the corner from my home and it starts pretty early(7:30am). The other thing is that I really like to sign up for races when they are at their lowest price. Yes, when you sign up at that time, you hope you will not be hurt or sick or the weather is bad but you get a lower price. In this case, $25 lower if you signed up right away versus going to the race on race day. That's another 5/10k race I could do! This is how my mind thinks. Haha! So do you feel like you are missing something when you don't race a particular race the following year? Personally, I like to change up the races so I have not run that many in a row. Some I have really like(like the Crim 10 that I'm missing this year) and some not so much. The Solstice Run 10 mile this year in June will be my third time running this race and THE only race I have run three years in a row and since they have started it(the 10 mile that is). It's a great race and challenging course(not TOO challenging) as well. 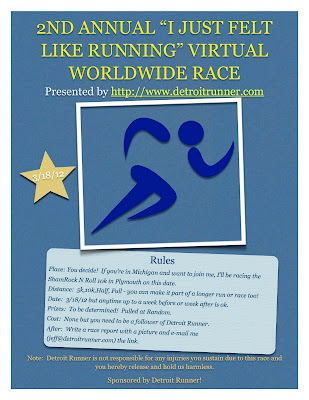 I posted a new Photo on Detroit Runner Photography as well! Enjoy! 5 miles on the schedule today! Done and feeling good. 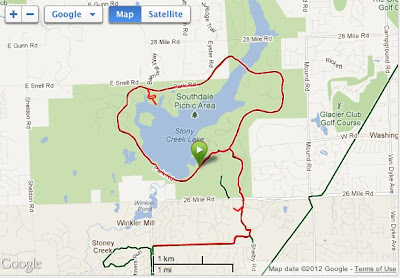 Can't wait to run on Sunday at Stony Creek! 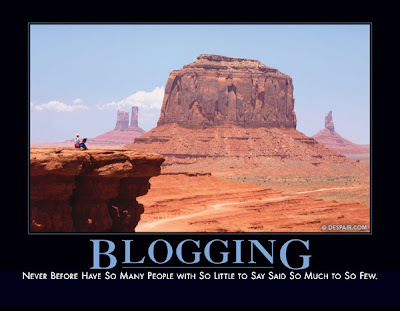 This is so true, don't you agree? I also put up a couple new pictures on my Detroit Runner Photography Blog. A couple micro pictures. Enjoy. 5 miles on the schedule today....done! Another 80 degree yesterday and we are expecting close to 80 degrees today as well. Looks like the weekend is getting cooler. I might have to bring out the long pants/sleeves again. The horror! I was talking the other day with a fellow blogger, Matt from Faster Than a Turtle and believe me when I tell you he's WAY faster than a turtle. He's training for his first marathon coming up in May but has not gotten his nutritional needs worked out quite yet. It actually reminds me of me when I trained for my first just last year. I was really struggling with nutrition and having enough in my stomach at the beginning of the race. I tried to eat more but was just worried about my stomach hurting from feeling full. I actually still eat what I did for the first race-- maybe a little more. My pre-race routine has been a half banana and a granola bar. It seems to work for me. 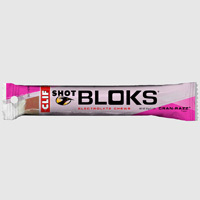 I have since added Shot Bloks to my nutrition on my long runs and I also try to eat them regularly throughout the marathon starting at about mile 3. I try to eat one ever three miles at least until mile 21 because usually after that I just cannot stomach any food. 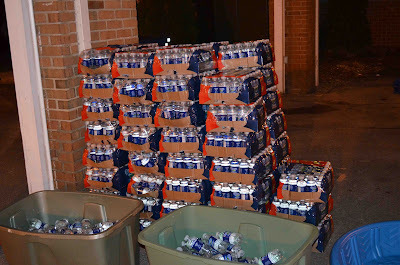 I've also been very good at hydrating throughout my training and while on races. 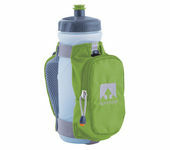 I always carry a Nathan water bottle and it has proved invaluable for me. The best thing is that I don't have to stop at the water stops along the race except to refill. So what's your advice? What do you do to fuel yourself on long runs and races? Share your advice and help a fellow runner out. By the way, the one that writes Faster than a Turtle is hoping for a 3:15-3:30 time. That's faster than a rabbit, isn't it? 5 miles on the schedule today....done! Ha! 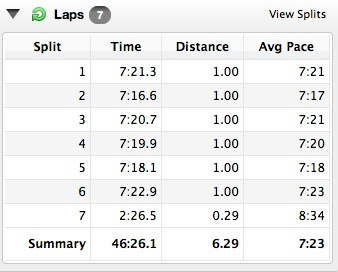 Still felt a little tight from my race Sunday but overall pretty strong run. 5 weeks to go until my next race. It's the Glass City half marathon. I can't wait to run this event. The half marathon distance still remains my favorite distance. Long enough for a challenge but short enough for no break in training needed. It will be my first time down there. Looks like a really great route plus you get to end in the stadium at Toledo University. I've never finished in a stadium but have finished on a track for a couple races. Loads of fun! 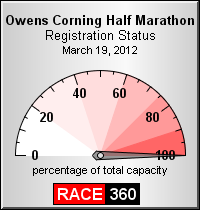 The half is sold out but you can still run the marathon if interested in attending - still only $70 for the full. Not a bad price. I'm still thinking about doing a 50k next year(most likely trail) - I know, the race season just started and I'm already thinking about next year. Any suggestions? Favorite races? I mean, how much worse can it be than the marathon? Haha! 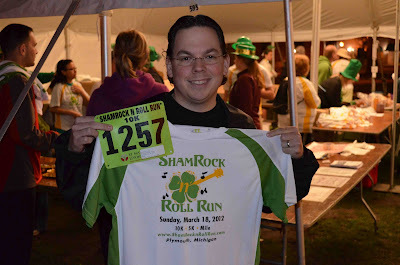 Well I left it out of my race report but on Sunday, I saw a girl that finished the ShamRock N Roll race just about the same time as me. Unfortunately(or fortunately) she puked pretty bad at the end of the race. I felt bad for her but my thoughts were she left nothing on the table(literally - ha) and ended her race knowing she did everything possible to get her time. I say congratulations. Some say gross. What do you say? Another incredible week of running and training for me. This week I topped out on my mileage with over 44 miles this week. This is the longest I have run in a week during any training period and, believe it or not, I'm still feeling good. To top off the week, I also ran a 10k race yesterday and had a PR(Personal Record) of 45:55 for a 7:24 average pace. I was very happy with this even though I really wanted to be under 45 minutes. I got the entire family involved this year in the race so one of my brothers raced the 10k and another did the 5k with his wife along with my Dad and my Aunt. It was a great time. I love to throw races into my training schedule. It helps show you how your training is progressing. Also, if you have not done any races, it's a great idea to get out there to a shorter race so you can learn the ropes about what goes on in the races so that you don't have that stress at your marathon. Fortunately, for me, this past race, was my 23rd race so I'm pretty used to how things work. For the other part of the week, I ran Tuesday through Sunday. Normally I don't run six days in a row but this week it was necessary. I had an 18 miler planned for Sunday but since I was racing on Sunday, I did not want to run that plus do the race so I moved Sunday's run to Saturday and did 12 miles on Saturday and still did the race. It paid off with my PR. Fortunately, even after those higher miles, my legs have felt really good this week. I'll add back the cross training this week as well given the reduced miles coming up. Upcoming is a cut back week so I'll only be doing 36 miles this week. Ahhh, only one eight mile run before work - I can't wait. Also my long run will be cut to 13 miles but I'm sure I'll make it a 13.1 for the half marathon in me even though I'm not doing any race. 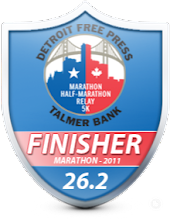 I've only got one more half marathon before my full marathon and that's going to be the Glass City Half marathon - a sold out event! Only 7 more weeks of training until the Flying Pig Marathon. I hope your training is also going well. First I'll give you a summary of my main observations. Well organized race - you knew where to go, where to park, where to start. This helps eliminate the stress of getting to the race. It all started with their website and went through to the finish of the race. Course - A great course starting in downtown Plymouth, running through the downtown area, around subdivision downtown and finishing downtown. Even though this was an open course, the police and marshalls did an excellent job with traffic. They also did a great job at placing the mile markers in the correct place. I've been to races where they were off almost a 1/4 mile! 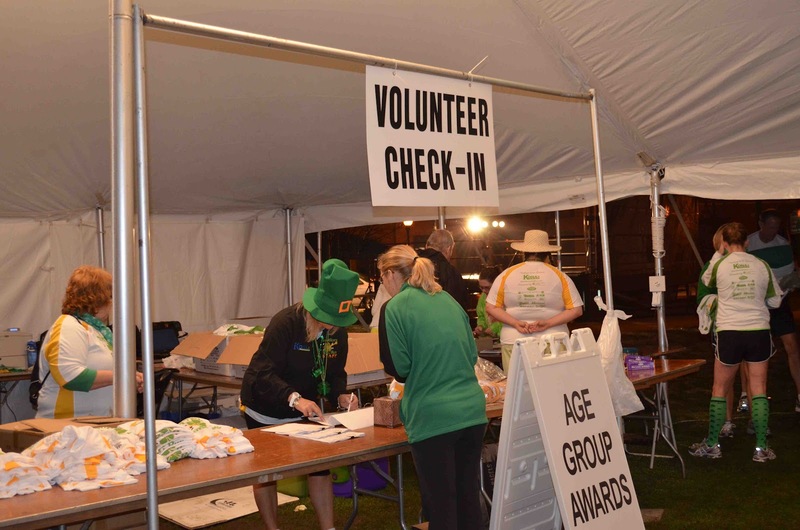 Volunteers - Friendly, helpful, cheering, smiling, and knowledgeable. It's make a difference when you are racing and I appreciate all the efforts they gave. Start/Finish lines - Both well organized. Even with the crowd, I felt there was plenty of space at the start and more than enough room at the finish. Food/Drinks - Well stocked and very organized - given there was two lines, that helped keep things moving and is appreciated when you just finish a race. There was plenty of everything for even the last of walkers. Entertainment - I heard them but didn't see them. I knew they were in the tent but I forgot to go over and see them and get a picture. Great music. The entertainment before the race was really nice too. It gave a really nice hometown feeling. I also liked having a local child(Race director's Daughter) do the National Anthem. It keeps that hometown feeling. Atmosphere - All you could see was smiles. People seeing others they knew. People chatting about racing and the race. Nice family atmosphere. Port-o-potties - I'll admit that this is one that I was a little concerned about. I was not sure there would be enough given the amount of people attending the race. I will say; however, that I got in line just before the race(20 minutes) and it only took about 5 minutes in a very long line so there was more than enough set up. I also like the fact that they were placed in a great spot right near everything but out of the way enough to not have to see them the entire time. Registration - Another well organized area. First, online it was very simple to go in and register for the race and you received a confirmation so you were ready to go. You could pay online as well, which made things easy, and you could register for more than one at the same time. 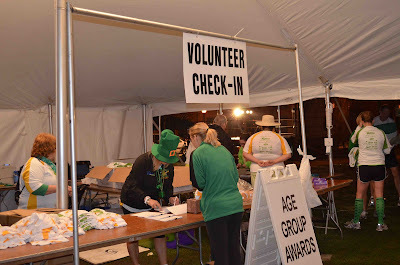 At the race, volunteers knew what needed to be done, they did it quickly and we got in and out fast. We got our shirts and bib and were ready to race. There were safety pins set up in blocks of four so you could just grab one. Again, it's the little things like this that make a race really nice. Money's worth? - Absolutely! 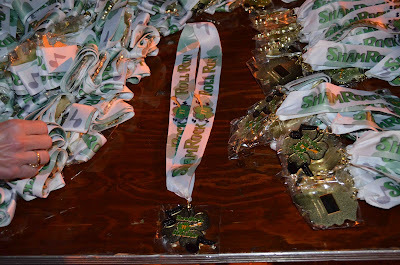 You got a certified course, tech shirt, a medal(10k only), great food at the end, a great course starting in a great area. The police support was awesome and obviously the City support was great as well. Location - it's great starting in a downtown area and finishing there as well. Overall - a great race, very well organized, fun, family atmosphere. One of the best races I have been too. Would gladly do this race again! As I have said in the past, the people at Kona Running Company know how to put together a race for runners but make it fun for walkers and their families as well. Today's race was the first one of the year for me and likely the first one for many people today. 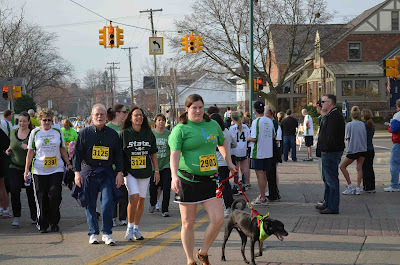 The weather was absolutely perfect in the low 50's to start the race. Can you believe we had such good weather? I'm sure that will go down in the history books as one of the warmest races in March. 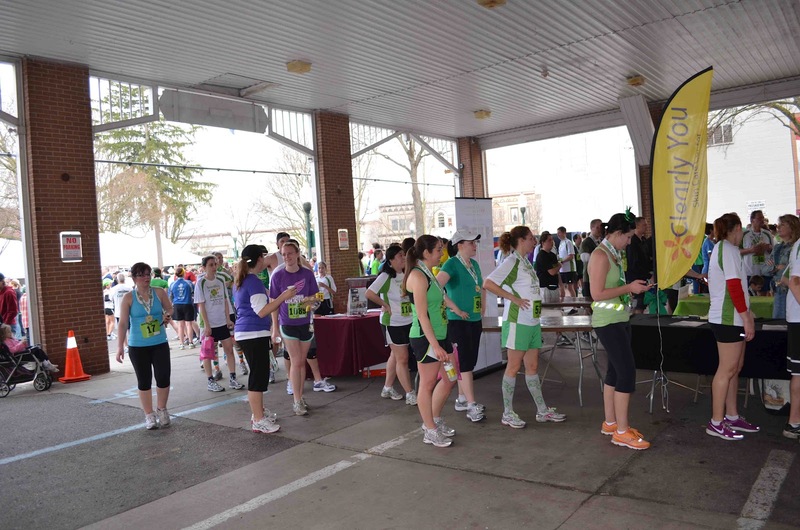 Today's inaugural ShamRock N Roll run was by all counts a complete success. There were thousands of runners for the 10k, 5k and one mile races. We got there pretty early at 7am and volunteers were already very busy working away getting everything in place and ready to go before the start of the race. I wanted to get there early to take some pictures for this review. On the way over to the race, we had seen lightning but it was South of the location in Plymouth and by the time we got to Plymouth, the skies were clear. My streak of good weather at races continues as this was my 23rd race of my running career. 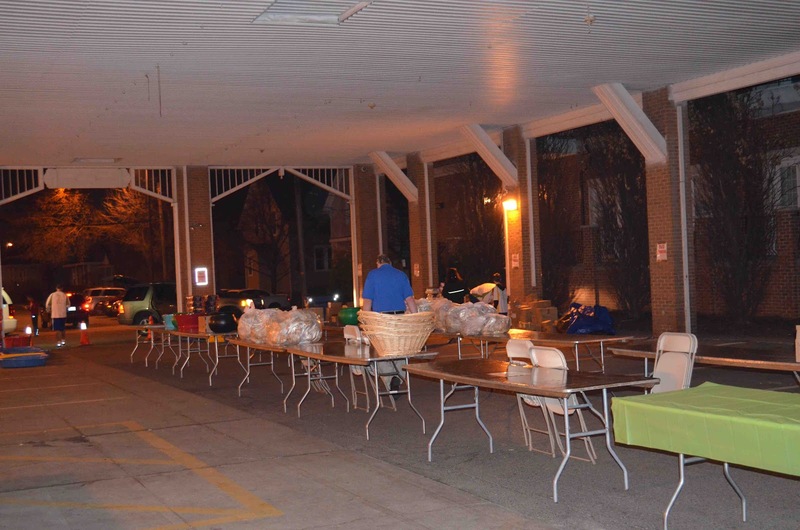 As you can see below, volunteers were getting everything in order for the food lines under the pavilion. The finish line was up and ready to go! They were getting the medals in place and ready for all the 10ker's to receive. A volunteer was nice enough to put one out on the table so I could get a picture of it. 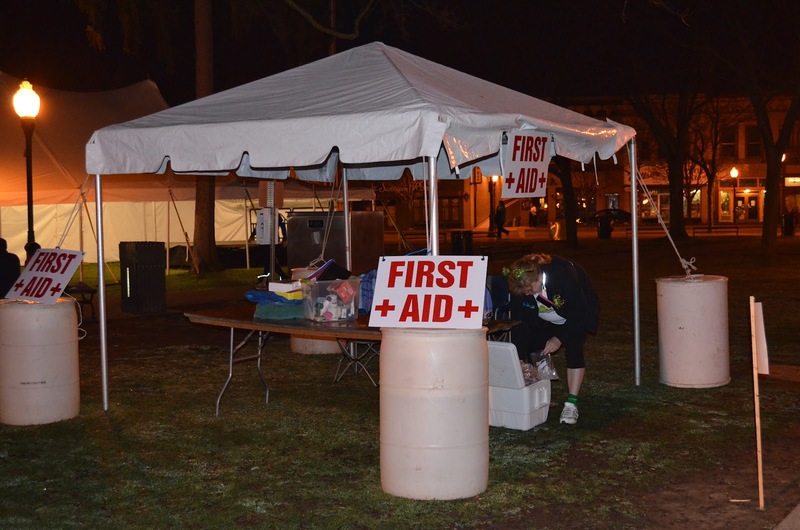 The First Aid station was ready to go and hopefully was not used at all(at least that I saw) There was also two ambulances located near the finish line ready to help. Safety is a priority for the race director! 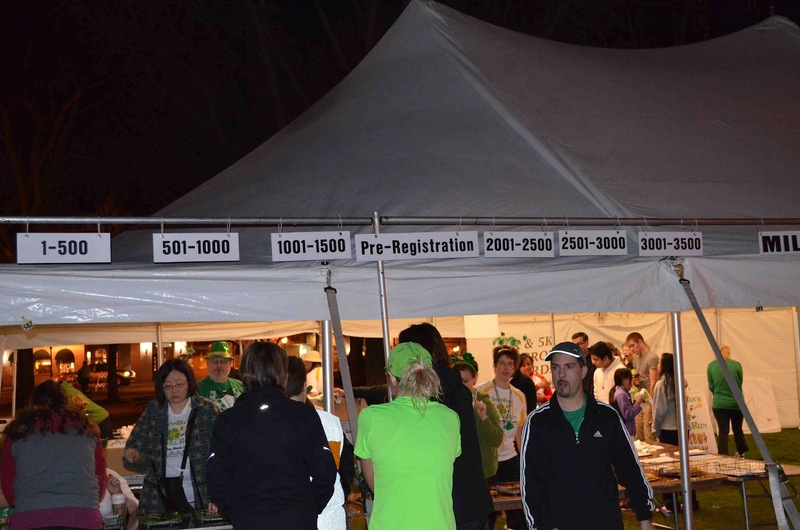 The numbers on the registration tent(below) were clearly marked at the top so if you knew your number, you could go right up. If not, they also had a board with all the names/numbers on there in alphabetical order so it was very easy to check in and get your bib and T-shirt. The volunteers were well organized and it only took a minute or so to get everything. Of course, as the race neared the lines got much longer but everything went very smooth from my observation. 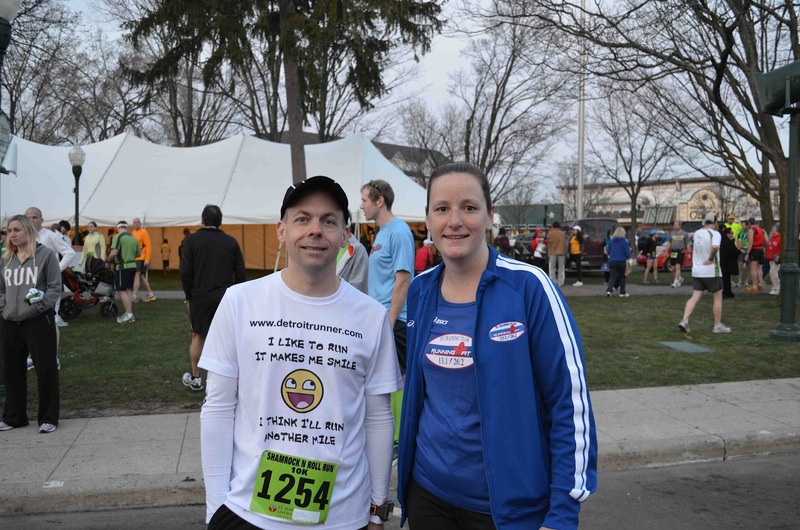 Here's my brother who raced his first race ever, the 10k! He's showing off the sweet shirt that you received when you picked up your race bib. The bib's had the B-Tag on the back for timing using the latest technology to keep track of runners times. The race even had a place for volunteers to check in so all of them knew what they should be doing and where they should be going. 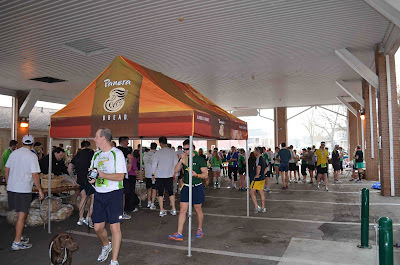 Speaking of volunteers, there were also many out on the course as well including marshalls and water, GU brew stops. They were all very enthusiastic and cheering as the runners ran by them. 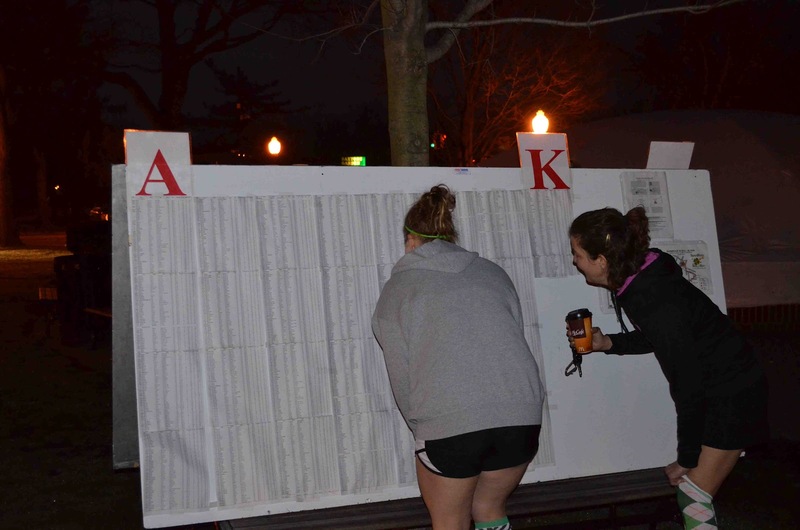 Here's the board you could go to in order to find your name and your bib number to pick up your bib. This made things very, very simple. I forgot to bring my confirmation slip but since the race was so organized, you did not need it. 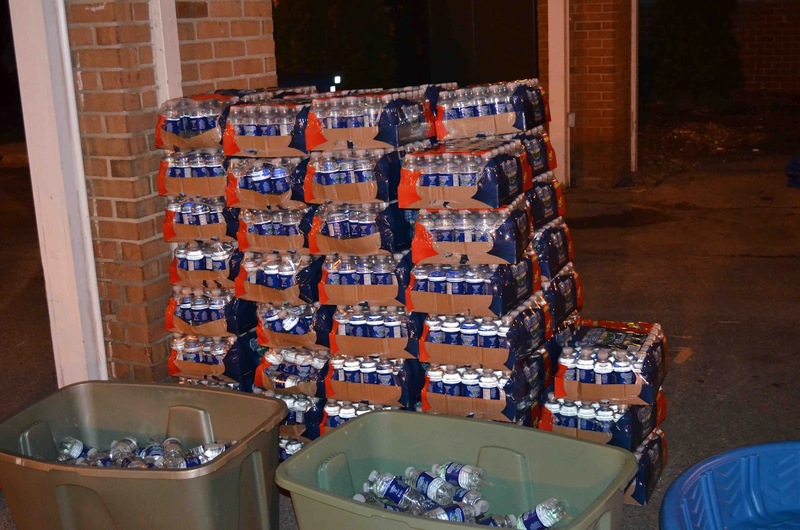 The race was also very concerned about running out of water given the higher and unusual temperatures in March. There was plenty of water and food for everyone. I know this because my Dad and Aunt walked the 5k and there was still plenty of everything for everyone when they finished. 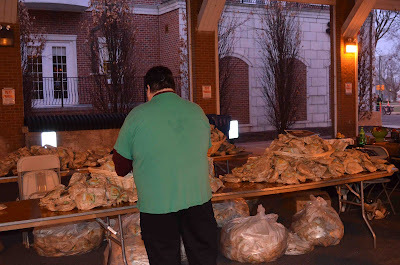 Here's a volunteer putting out the bagels so they were ready for everyone. 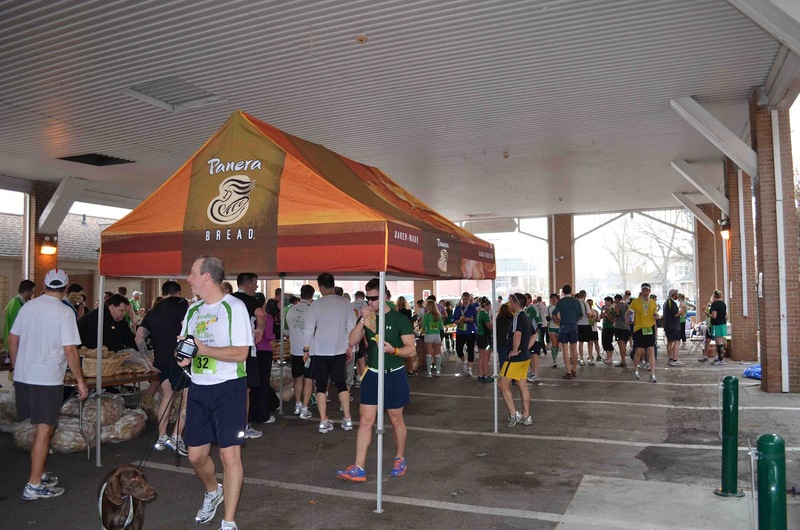 I have been to other races where you just grab a bagel as you are in line from a basket. These were individually wrapped so it made it much more sanitary. It's the little details that make a race from good to great. As you can see, they had tons of bagels courtesy of Panera Bread. Yum Asiago Cheese! Also, you will notice that the volunteers sorted out the type of bagel. This made things much quicker when you were in line to get something because you did not need to look around for it since it was easy to find. That certainly made the line move through quicker. Again, it's these little things that make the race that much better. Here's some of the crowd waiting for the start of the 10k. 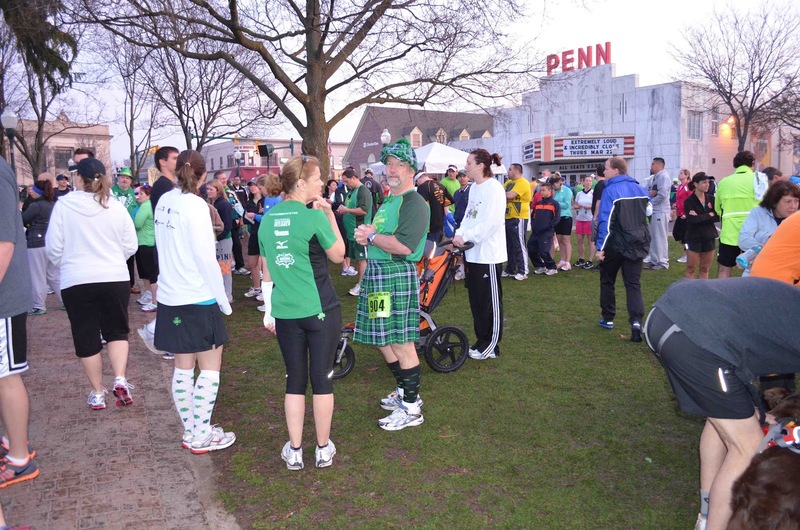 I happen so see this guy in a Kilt that was running and thought that was really cool. I just hope he didn't wear it the proper way underneath. Haha! I also saw Rose from Hacker Half Marathon just before the race and got a quick picture with her. She ended up taking two minutes off her PR! Crazy! Congratulations Rose! After the picture with Rose, we headed to the start line to get ready. There were lots of runners and I was looking to get in line properly this time so I did not have to run around as many runners. Just before the start, Alan's daughter sang the National Anthem(quite nicely I might add especially for a 12 year old). Then the dance team in the area did a great dance to a Huey Lewis & the News song, Heart of Rock N Roll. Alan, the race director, made a countdown, blew the air horn and we were off and running! Overall it's a flat course but there is a little elevation in the first mile that I did not realize. 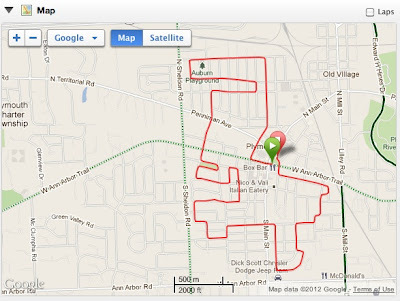 It's nice using the Garmin so you can see what changes it brought. 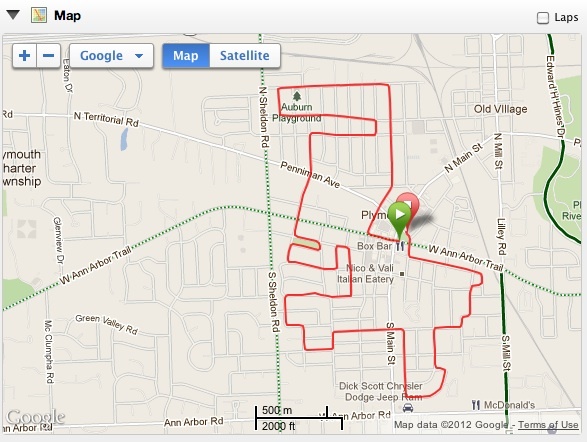 Of course, the course map was exactly as the race staff showed it on their website. 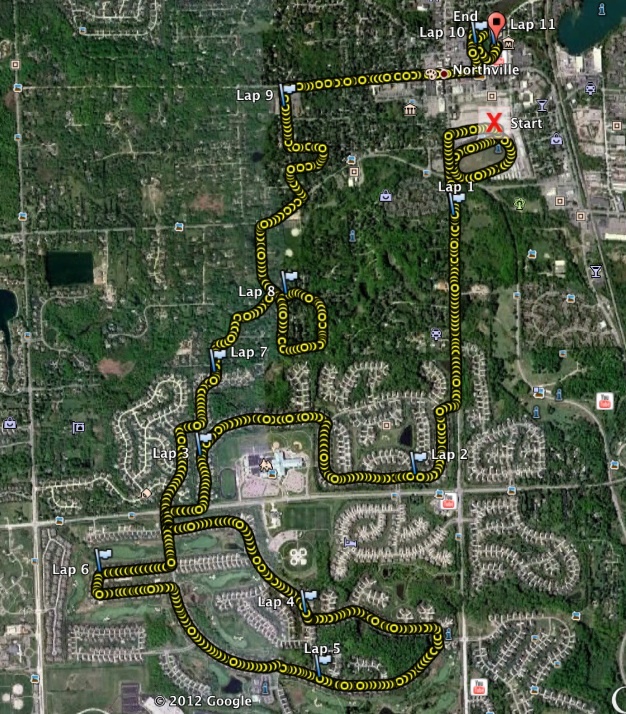 Here's the Garmin map of the course. Total measurement of 6.29 on my Garmin which is slightly off since I forgot to turn it off at the end. The course was slightly longer than the 6.20 requirement so it was perfect and met the certified standard. After the race, I watched the runners come in while I was also waiting for my brother to finish. Some people had some crazy costumes like this guy in the green wig! Haha! 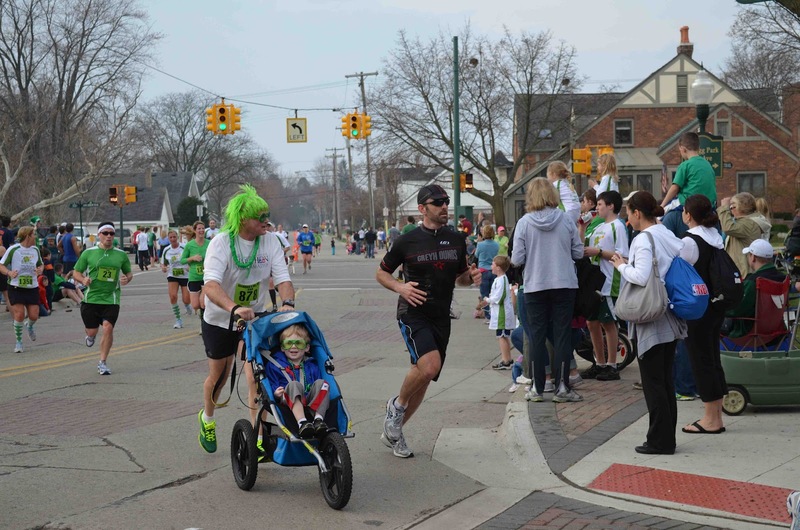 I'm impressed that he was able to push a stroller for 10k! 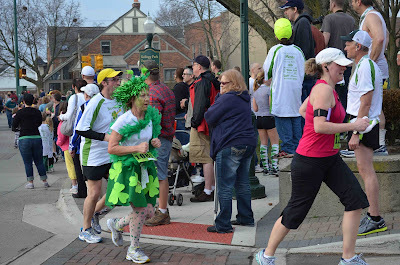 Here's another woman all decked out in St. Patrick's Day attire. There were so many people dressed up having fun with it which was great! Here's my bother in the black shirt finishing up his race too. After the race, I was also able to meet up with some local bloggers - Megan & Ryan from WatchMeGoRun and Josh from Clippin' Along. As you guys know, I have seen Megan & Ryan at many races since they goes to about a billion races a year but this was the first time I met Josh. All three of them had great times and had a ball at the race as well. The race had two lines running for the food. This was a great idea as it kept the crowd moving so things did not get backed up in this area. People were easily able to get their food and move on. The lines were also under a pavilion which is the best place for it in case of rain. Fortunately, the weather was perfect for the entire time we were there. Later, I watched my other brother come in from the 5k. He's the one in green with grey sleeves. Unfortunately, I missed his wife finish as she came in just before him. It was also great to see Alan Whitehead, the race director talking to people after the race. It's great that he was keeping up on things to make sure everyone had a great time and things continued to run smoothly. 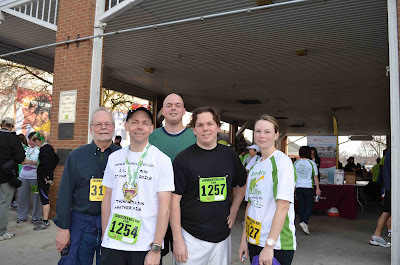 Just after I saw Alan, my Dad and Aunt came in from walking the 5k. This was my Dad's first 5k ever and he did great! He may have been a little overdressed(in jeans) given the weather but otherwise he did good. After everyone was done, we got some pictures by the pavilion. 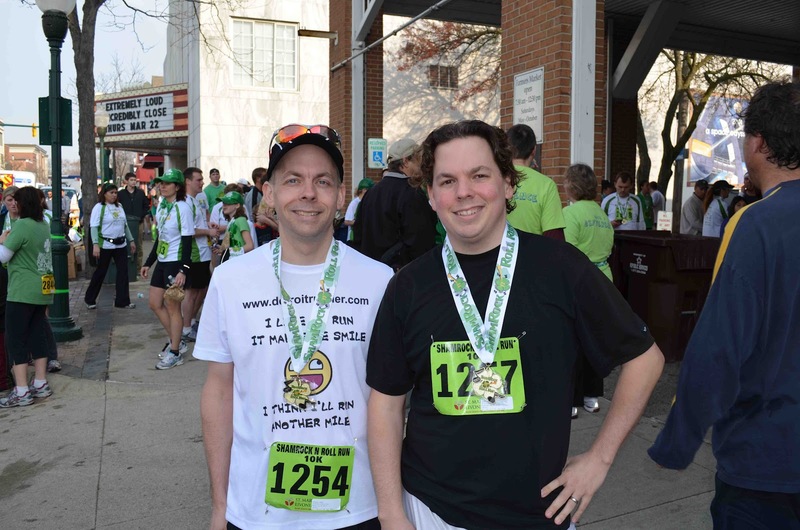 Here's my brother and I with our race medals. 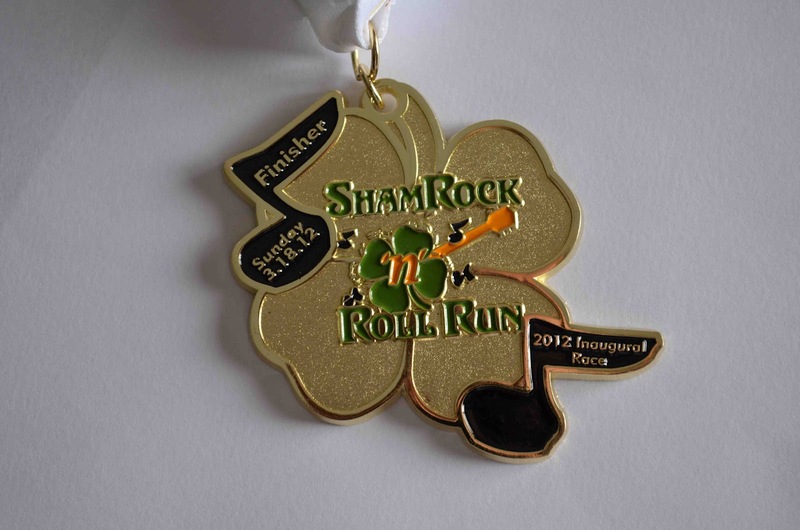 Awesome bling I might add especially for a 10k. Here's another one of everyone else with me including my Dad, brothers and his wife as well. 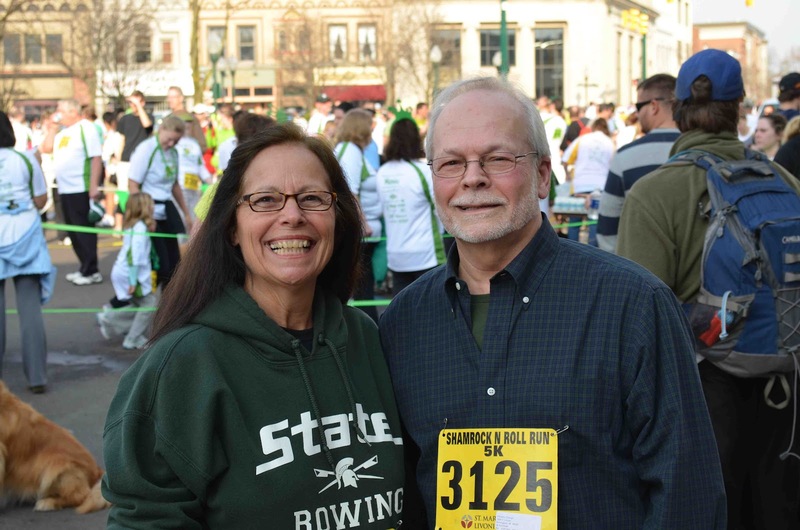 This is my Aunt and my Dad after they finished their 5k. Very exciting! 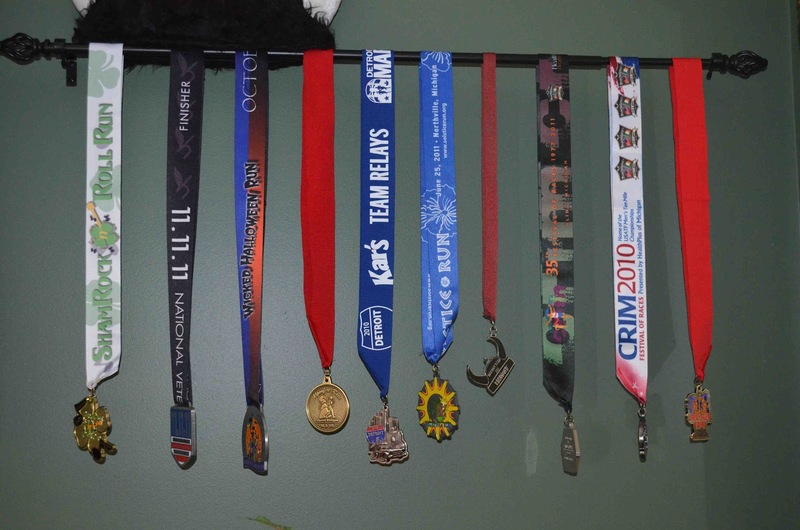 And here it is, the race medal place on my non half marathon or marathon race hanger. 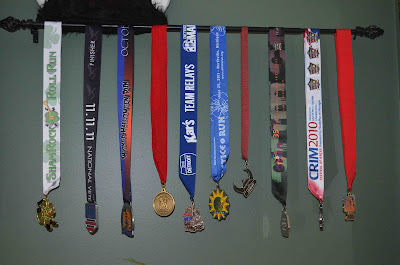 If you look closely, you will notice that there are four medals from Kona Running Company races over the years. My very first race medal was the Solstice 10 mile race in 2010. A race that I will run for my third time this year - the only race I have run more than twice. If you ran today's race, give me your input/suggestions here. I'd love to hear what you thought about the race. Any feedback left here will also be reviewed by the race staff to continue to improve this race each year. Think this looked like a great race? Sorry you missed out? Want to run another race put on by Kona Running Company? Up next for them is the 10 miler/10k/5k/1 mile Solstice Run starting at Northville Downs in Northville, Michigan. Train for hills! Race date is June 23rd, 2012. Sign up now for discounted pricing online. 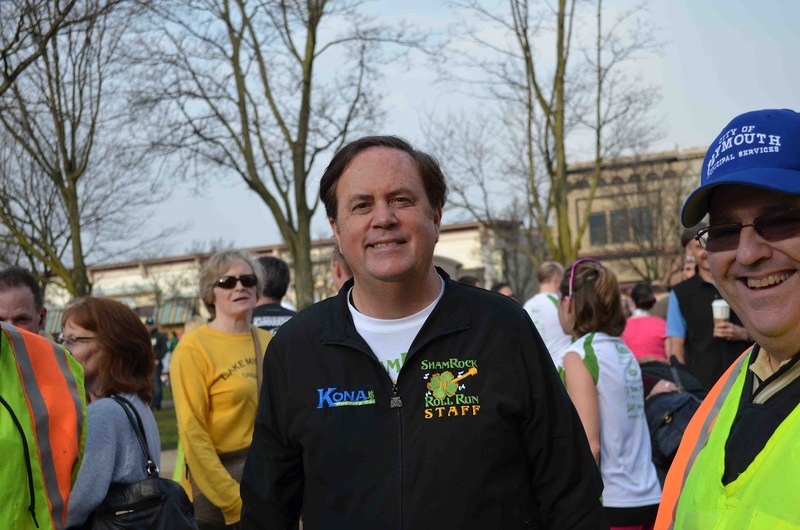 If you want to sign up or learn more about the Solstice Run, you can do so by clicking HERE.